Chalcedony and Jasper are two distinct gemstone varieties of the diverse quartz mineral family that occur abundantly throughout the Gila Country of Southwest New Mexico. Both of these gemstones are composed of cryptocrystalline quartz, meaning that they consist of a tightly-bound aggregate of tiny crystals of quartz, SiO2, so small that it requires a polarizing or electron microscope to resolve the individual crystals. 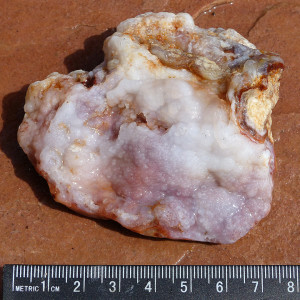 While chalcedony and jasper are commonly found together in areas where volcanic activity has been extensive, they differ markedly in appearance and their origins involve somewhat different processes. Large Chalcedony vug filling showing botryoidal texture. Chalcedony is best described as a dense, semitransparent or translucent variety of SiO2 consisting of a cryptocrystalline intergrowth of mostly quartz and lesser amounts of moganite, another form of SiO2 that has a different crystal form. Chalcedony breaks with a conchoidal fracture and commonly displays a waxy, vitreous, or silky luster. In terms of color it is most commonly white to gray, sometimes displaying a blue or pink tint due to mineral impurities or an optical phenomena known as Rayleigh Scattering. (Chalcedony by definition does not show distinct layers of color banding; if color banding is present then the specimen is called “agate”.) It has a hardness of 6 to 7 on the Moh’s Scale and a Specific Gravity of 2.6. In the Gila County, chalcedony can assume a wide range of unique and interesting shapes and forms, depending on how, where, and when it formed in the volcanic host rock. 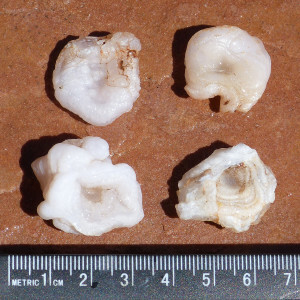 In general, chalcedony forms by filling cavities in rocks. Such cavities may form as gas bubbles in a lava flow; irregular vugs or open space within a solid rock; or horizontal cavities along bedding planes, that result from solution of the preexisting rock, faulting or movement within the rock, or other geologic processes. Geodes, for example, form from the partial filling of gas bubbles in this manner, often consisting of layers of chalcedony which only partially fill the void which is then lined with macro-crystals of quartz. In other cases, the chalcedony (or if it shows banding, agate) will completely fill the cavity, resulting in what is known to rockhounds as “thunder eggs”. White Chalcedony lens-shape deposit showing botryoidal texture on upper surface of specimen. 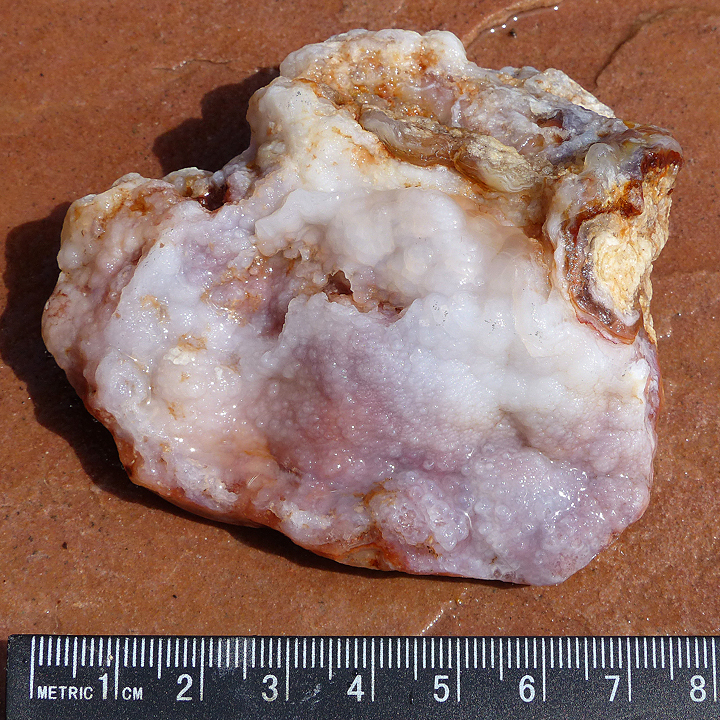 Chalcedony was precipitated from low-temperature, silica-rich aqueous solutions circulating within a horizontal bedding plane cavity within an earlier deposit of volcanic welded ash-fall rhyolite tuff. 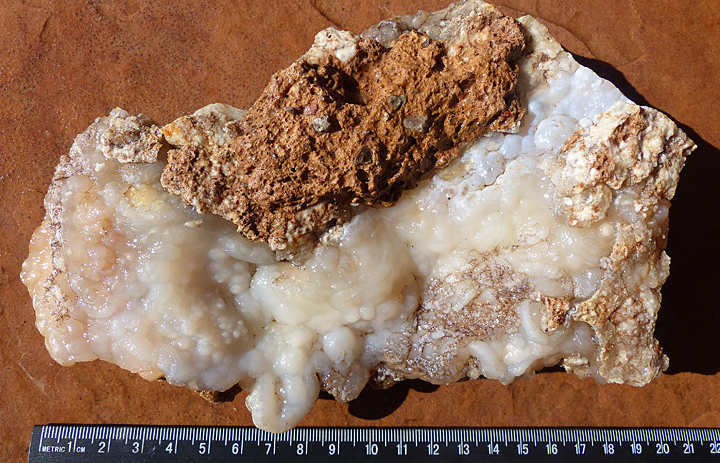 Brown material at top of specimen is a layer of iron-stained rhyolite ash-fall welded tuff host rock that overlies the chalcedony. Chalcedony Spheres and Ellipsoids. Gas bubbles in lava flow rock are often filled over time with Chalcedony precipitated from silica-rich aqueous solutions that penetrate the rock. 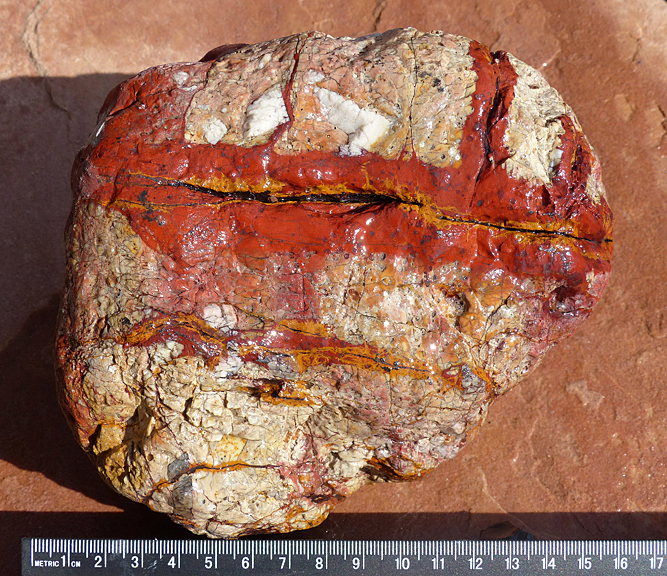 The two ellipsoids on either side of the two spheroids are gas bubble fillings where the gas bubbles were stretched and elongated before the lava flow cooled and hardened. Sometimes the gas bubbles are only partially filled with Chalcedony leaving a flat spot on the up-side of the spheroid or ellipsoid, as can be seen at the bottom of the top spheroid (in the flow rock the flat surface would of course been at the top of the gas bubble). 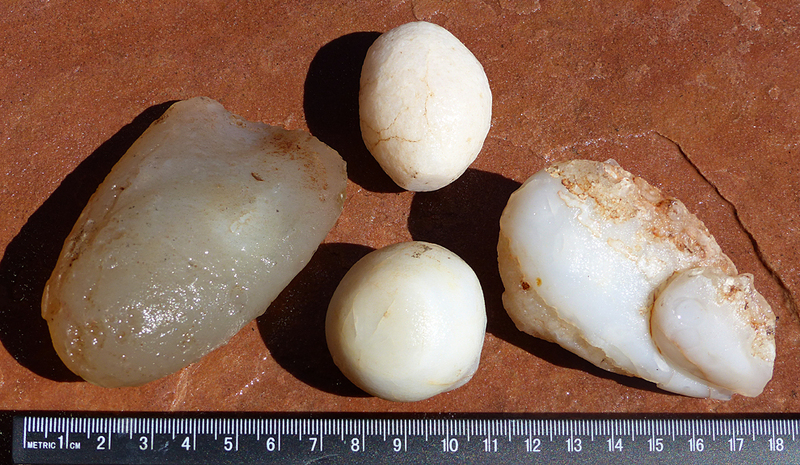 Minute changes in amount of impurities in the silica-rich solutions can result in faint color banding or layering in the Chalcedony as in the top specimen, or as intersecting or impinging growth forms such as these two Chalcedony Roses in the bottom specimen. These represent just two of the various processes that produce the endless variety of shapes and forms of Chalcedony. “Wormy” Chalcedony. 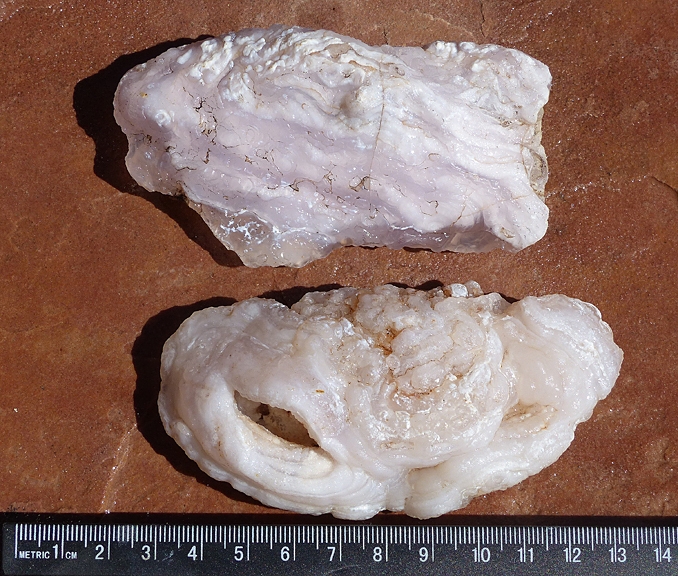 Sometimes the injected Chalcedony takes the form of masses of undulating tubes or “worms”. In this specimen two distinct compositions of Chalcedony are present, representing a complex history of silica gel injection and slow deposition and formation. 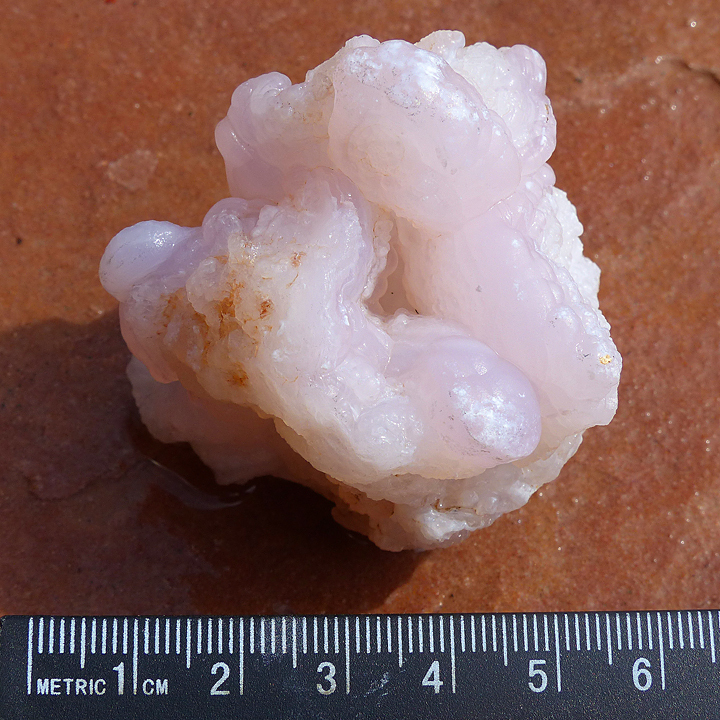 Given an open space or cavity within a rock, chalcedony forms when subsequent silica-rich watery fluids or viscous silica gels enter or are injected into the cavity. This process occurs as a result of hydrothermal circulation at low temperatures and pressures, from which the chalcedony is either deposited in molecular thin layers that slowly over time either partially or completely fill the cavity, or all at once in the form of a viscous gel. 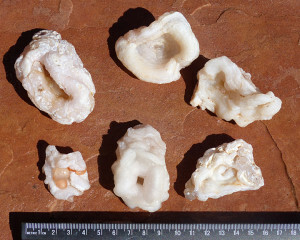 Commonly, the surface of the chalcedony deposited within a partially-filled cavity will display a smooth, but lumpy, surface known as a botryoidal texture or habit, resembling a bunch of grapes. Another common occurrence is that of the surface of the chalcedony filling being covered with small quartz crystals, known as druzy quartz. A half-dozen Chalcedony Roses. No two alike, these cup-shaped Chalcedony specimens “grow” when low-temperature silica-rich aqueous solutions or silica gels fill vugs and open cavities in previous volcanic rocks, either slowly depositing layer upon layer of cryptocrystalline quartz or a much more rapid injection as a viscous silica gel. Highly resistant to chemical and physical weathering the roses are released when the enclosing host rock is weathered away at the surface of the earth. Four Chalcedony Conchos. Named after the silver button-like ornaments found on belts and other pieces of traditional clothing in the Southwest, these interesting forms are essentially smaller versions of Chalcedony roses, both in appearance and manner of formation. Like the larger roses, no two conchos are alike and often display coatings of tiny, sparkling druzy quartz crystals as displayed by the two conchos on the bottom row. This exceptional specimen displays a snow-white Chalcedony Rose “growing” on a botryoidal surface of a layer of fire agate. Considering the fact that the Chalcedony Rose and the Fire Agate layers represent deposition from silica-rich aqueous solutions of greatly different compositions, the exact sequence and manner of formation of this specimen reflects a highly complex history. A unique and highly sought after form of chalcedony that is commonly found within the Gila Country is a type known as “Chalcedony Roses”(see excellent photos towards the bottom of the linked page). These unusual specimens consist of flower-like growths that formed when a hot silica gel of chalcedony composition, having a viscosity perhaps similar to that of toothpaste, was injected under pressure into the open cavity. No two roses are alike in size and form, making them highly collectible. 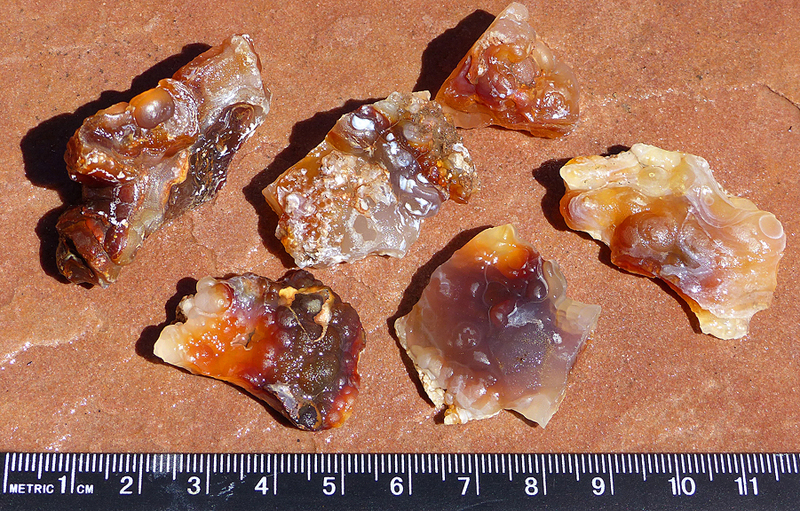 Six specimens of Fire Agate as found in the field. Only with careful cutting and polishing can the translucent Chalcedony layers be removed to reveal the possible presence, absence or degree of fire in the stone. Fire Agate and Chalcedony Rose Pendant. 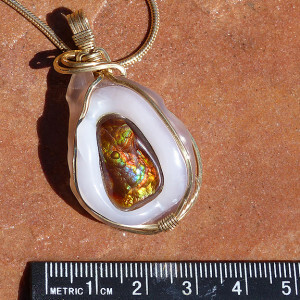 In this artistically crafted gold wire-wrapped pendant, an exquisite cabochon of Fire Agate has been set in the natural cup of a Chalcedony Rose. However, for most discriminating and serious collectors, the most precious form of chalcedony that can be found in the Gila Country and neighboring Southeast Arizona is a form known as “Fire Agate”. 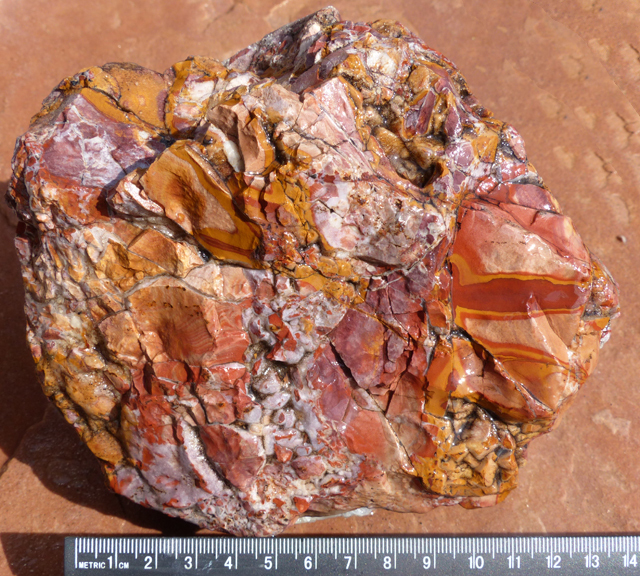 Fire Agate is generally not considered a true agate as it does not display the typical color banding of agate. 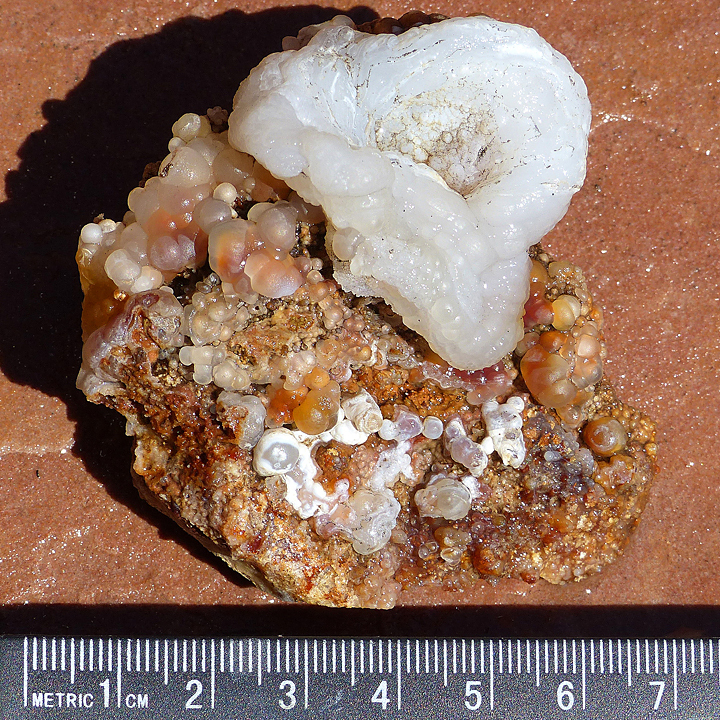 Rather, this interesting form of chalcedony consists of inclusions of molecular-thin layers of iron III oxide minerals Goethite FeO(OH) and Limonite (FeO(OH).nH2O. crystals which are deposited on the botryoidal surface of colorless, translucent to transparent chalcedony. 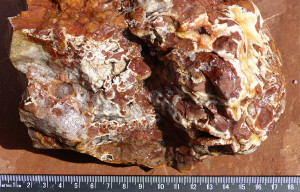 The Goethite and Limonite layers are in turn then subsequently covered over by additional thin layers of colorless chalcedony. When this sequential process is repeated several times it produces a gemstone, that when properly cut and polished gives a vivid, brilliant and complex play of various colors of yellow, orange, red, brown, green, purple, and sometimes blue. The cutting and polishing of fire agate is a fine art, requiring considerable experience to preserve and display the desired play of colors and not grind and polish the thin, delicate layers of color away. Is there Fire down below? Here a 1-3 mm layer of translucent botryoidal Chalcedony covers a 1-2 mm layer of Fire Agate (note Fire Agate layer showing on broken corner in upper right of specimen). Is the Fire there? Only hours of careful cutting and polishing will tell. 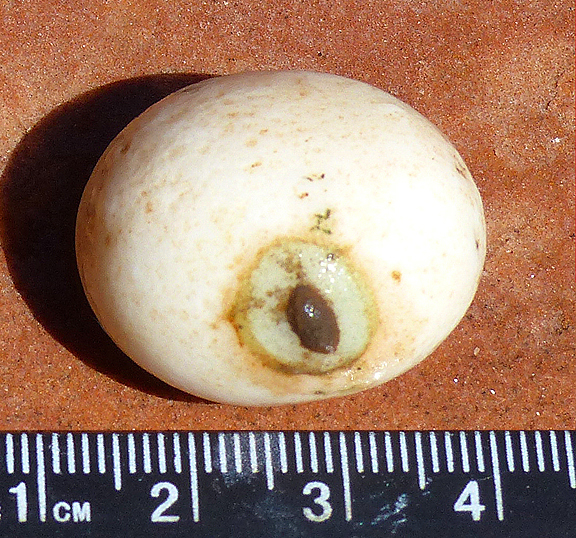 Petrified Alien Eyeball! Well, actually no. It’s simply a really bizarre Chalcedony Ellipsoid that filled a gas bubble. Specimen is exactly as found, and has not been altered in any way. The short answer is almost everywhere. The dominant geology of the Gila Country of Grant and Catron Counties is that of volcanic rock deposited between 34 and 15 million years ago. An earlier blog on this site, the Super-Volcanoes of the Gila Wilderness, gives a brief history of the major volcanic events that occurred here. Compositionally, the volcanic rocks of the Gila range from silica-rich rhyolites to silica-deficient basalts; however, in terms of absolute volume the silica rich rhyolites are by far the dominant rock type. Throughout Grant and Catron Counties are vast areas of uplifted mountain masses of these silica-rich volcanic rocks. The Gila National Forest alone, for example, encompasses some 3.3 million acres consisting primarily of such terrain. Surrounding these uplifted volcanic masses are adjacent, down-dropped trenches and basins that are filled with volcanic sedimentary rock debris that has been weathered, eroded, and subsequently carried by streams and rivers flowing out of the uplifted mountains. These sedimentary deposits range from older (5-10 million years), tightly-cemented sandstone conglomerates and sandstones, such as the widespread and ubiquitous Gila Conglomerate Formation, to more recent deposits, such as are currently being carried downstream in modern floodplains. Almost all of these rocks and sediments are likely to contain collectible specimens of chalcedony. Of course, some areas are better than others … and that’s where experience and the thrill of the hunt begins! While there are areas where collectible chalcedony can be discovered and extracted (generally with great expenditure of energy) from the matrix of solid volcanic host rock, such as around the tailings dumps of old mines, most experienced collectors will instead choose to let nature do the hard work, and hunt for specimens in the shallow, unconsolidated, weathered surface deposits covering the unweathered volcanic rock bedrock. For the less-than-determined collector the best method, and quite often the method that yields the greatest return both in terms of number and quality of specimens found, involves extensive walking across the surface of the vast areas of sedimentary deposits surrounding the uplifted mountain masses. 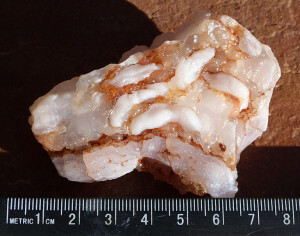 The reason for this is that chalcedony has a hardness of 6 to 7 and is highly resistant to both chemical and physical weathering, whereas the host matrix volcanic rock consists of a high percentage of minerals that are both softer and more-readily broken down through weathering and erosion. Hence, over time, the chalcedony remains unaltered, is totally freed from the matrix rock, and is concentrated in the sedimentary deposits. Collecting chalcedony in this manner is thus a walker’s or hiker’s delight, where success is proportional to the area covered. 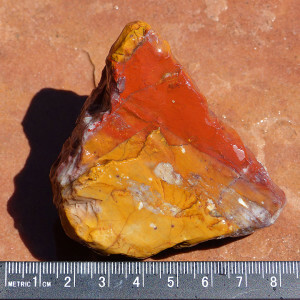 Jasper was used extensively by stone age cultures in the making of projectile points and other tools, and has been prized as a gemstone for thousands of years. Today, it is a highly sought after gemstone material that is mined from diverse deposits worldwide, and marketed under a variety of descriptive names depending upon the color and patterns displayed by the polished stone, such as “picture jasper”, “poppy jasper”, “ocean jasper”, “bloodstone”, etc. Vein Jasper. 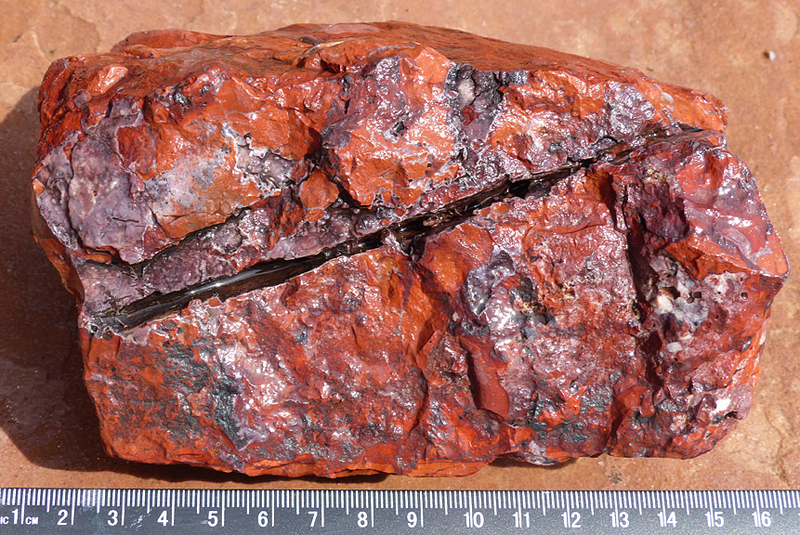 Originally a three to four-inch thick vein of Jasper in volcanic host rock, this specimen was subsequently eroded from the host rock and transported by stream action, surviving as an elongated boulder in sedimentary deposits. Stream worn specimen of Vein Jasper with surfical coating of white Chalcedony. Exceptionally pure and dense specimen of Red Vein Jasper showing conchoidal fracture. Worn stream pebble of Yellow Jasper showing conchoidal fracture. Worn stream pebbles of welded rhyolite ash-fall tuff displaying veinlets of Red Jasper precipitated along hairline fractures. 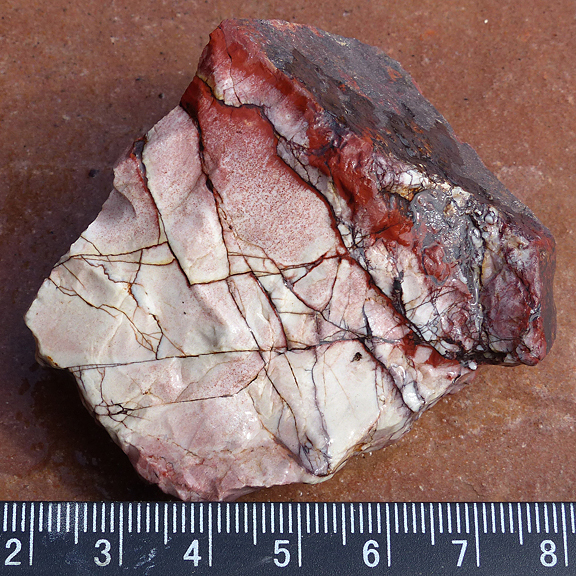 Thin veins of Red and Yellow jasper injected along fractures and cracks within shattered welded rhyolite ash-fall tuff. 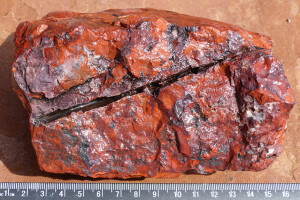 Note how iron-bearing, silica-rich aqueous solutions diffused outward from the veins into the somewhat porous and permeable welded tuff. Red Jasper and White Chalcedony Breccia. 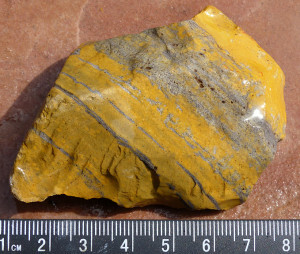 Jasper was originally emplaced as a vein filling, but subsequently shattered through faulting which allowed later deposition of Chalcedony by silica-rich fluids circulating through the broken rock. Jasper most commonly occurs in veins, or as fillings in cracks and fractures in volcanic rocks where it has been later injected and deposited from hot, silica-rich aqueous solutions percolating through the rock. 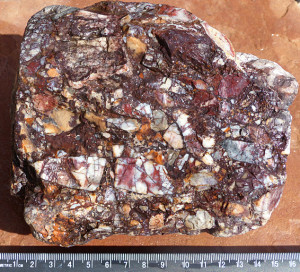 Sometimes jasper is deposited in fault zones where there have been repeated injections and precipitation from iron-rich silica bearing solutions which have been subsequently broken up by repeated faulting and internal crushing, and then re-cemented by further jasper deposition. 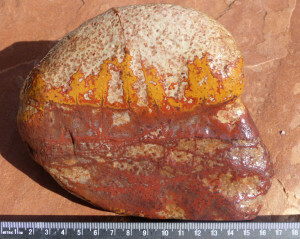 Such deposits are called jasper breccias. Jasper breccias can be quite distinctive and striking, displaying a complex assemblage of jasper fragments of diverse color, sometimes along with fragments of chalcedony and macro-crystalline quartz, and are thus highly sought after for use as a gemstone. Micro-veins of Red and Yellow Jasper penetrating and diffusing along fractures through welded rhyolite ash-fall tuff. 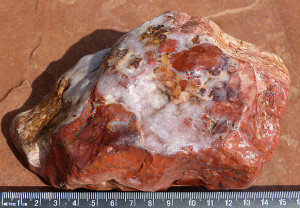 Chalcedony with slight impurities of cryptocrystalline Jasper and Jasper veinlets grading to pure Jasper with pure Hematite on upper joint surface. Purple Jasper and Chalcedony Breccia. This spectacular specimen shows numerous periods of Jasper and Calcedony deposition followed by subsequent crushing through faulting and subsequent cementation by more Jasper. Jasper is often found in all of the same places where chalcedony occurs. Since it forms in veins and rock fractures, where it is discovered in solid rock outcrops it can be hand quarried with modest effort using a hammer and chisel. 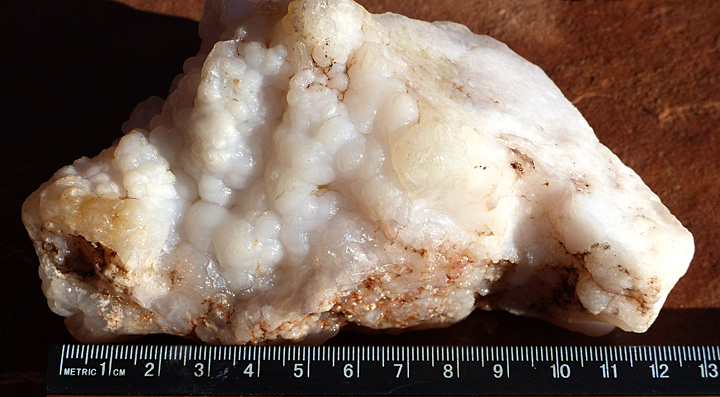 Such veins are not common, but can be found in areas of old mines and prospects. However, for the novice collector or person unfamiliar with the area and known localities, as was suggested for collecting chalcedony, the best (and easiest) approach is to walk the surfaces of modern sedimentary deposits which have been transported out of nearby volcanic mountains such as along river and creek floodplains, and dry washes, or to explore areas where there are exposed surfaces of weathered and eroded Gila Conglomerate. Jasper Breccia. 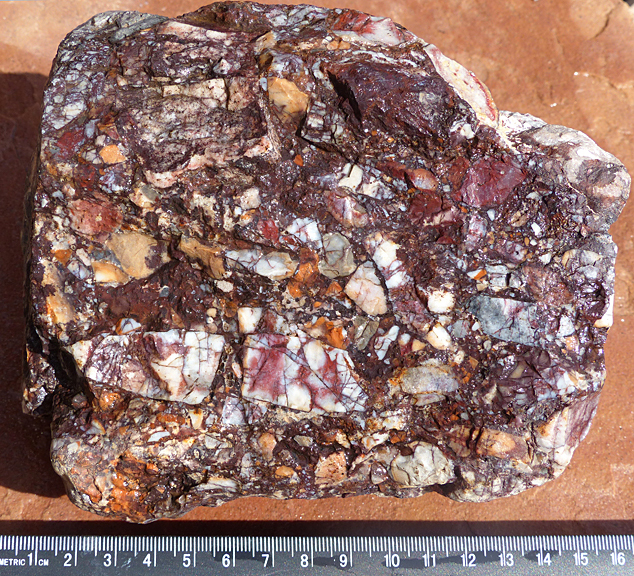 Untold episodes of repeated Jasper deposition, followed by crushing through faulting, and re-cementation have produced this unique specimen. 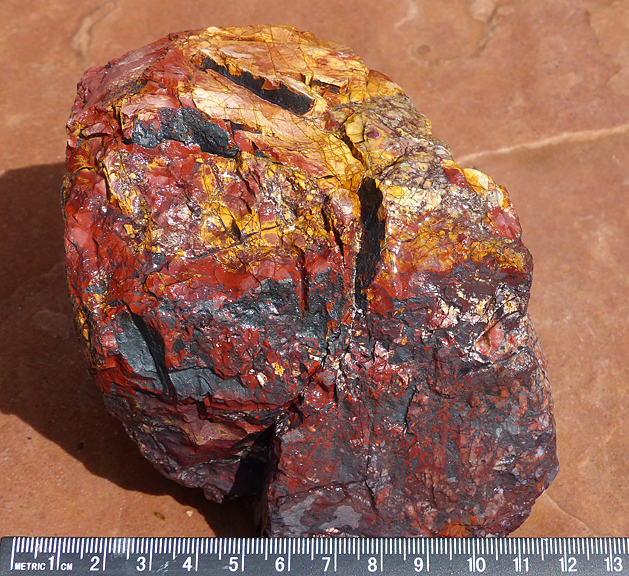 Colorful Red and Yellow Jasper Breccia showing coatings of pure Hematite (black) on fracture surfaces. Very complex history of formation. Within day-trip driving range of the Casitas de Gila Guesthouses there are unlimited locations where chalcedony, jasper, and other semi-precious gemstones, diverse minerals, and just plain interesting rocks can be searched for on the public lands of the Gila National Forest or Bureau of Land Management. Some of these areas are officially designated tracts of public land set aside specifically for rockhounding (i.e., Rockhound State Park, Black Hills Rockhound Area, and Round Mountain Rockhound Area). Casitas de Gila Guesthouses is familiar with many of these areas and will be pleased to provide maps, directions, and local information to our guests. Guests staying at Casitas de Gila Guesthouses are, of course, also most welcome to search for chalcedony, jasper, and other minerals and interesting rocks on the Casita lands. Except for around our home … where we place the rocks we have collected! Multicolored Jasper at its finest! 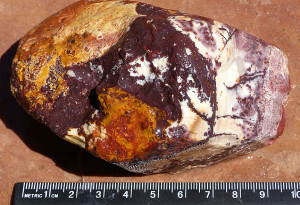 This entry was posted in geology, rockhounding and tagged chalcedony, geology, jasper, rocks and minerals. Bookmark the permalink.